Cook bacon in large nonstick skillet over medium heat until crisp. Reserve bacon and 2 tablespoons bacon drippings in skillet. Add broth; bring to a boil. Add orzo. Reduce heat to low; cover and cook 5 minutes. 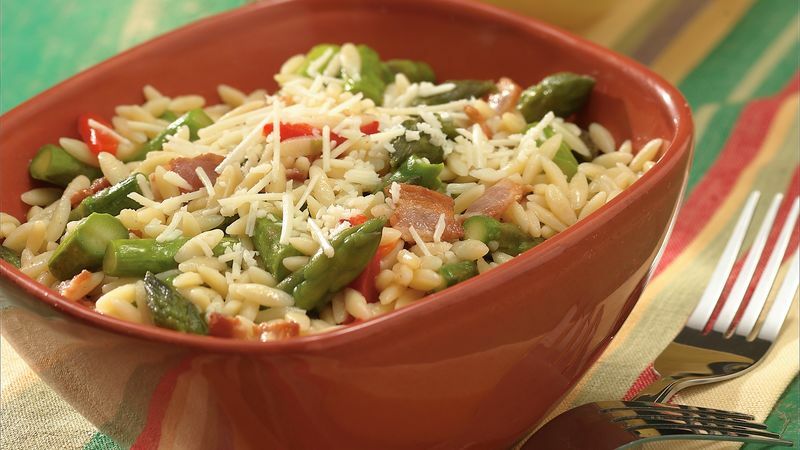 Add asparagus and roasted peppers; cover and cook an additional 5 to 10 minutes or until orzo and asparagus are tender, stirring occasionally. Sprinkle individual servings with cheese. Asiago is an Italian cow's milk cheese. It's rich nutty flavor sharpens as the cheese ages. Young Asiago makes a mild table cheese while aged Asiago is a flavorful grating cheese. Try aged asiago in place of Parmesan in your favorite recipes. It's easy to roast a red bell pepper for this recipe. Securely pierce a pepper through the stem with a fork and hold it over a gas burner flame, rotating it until it's blackened on all sides. Immediately transfer the pepper to a small paper bag; close the bag. let the pepper steam in the bag for 5 minutes, then peel it.